My free month of membership at the new Big Picture Classes site ends in less than a week! I have to admit that I've found quite a bit of INSPIRATION there so far this month. Along with the two pages I created using buttons, I've completed three additional layouts based on INSPIRATION in the Paige's Pages class. This first one was based on the lesson challenge to use circles on a layout. Paige's example used circles cut into fourths to create a large circle on the page, however I scraplifted this half page design by Jennifer Grace from the class gallery. Paige's next sample also used multiple little pieces of paper (1/4" squares!) 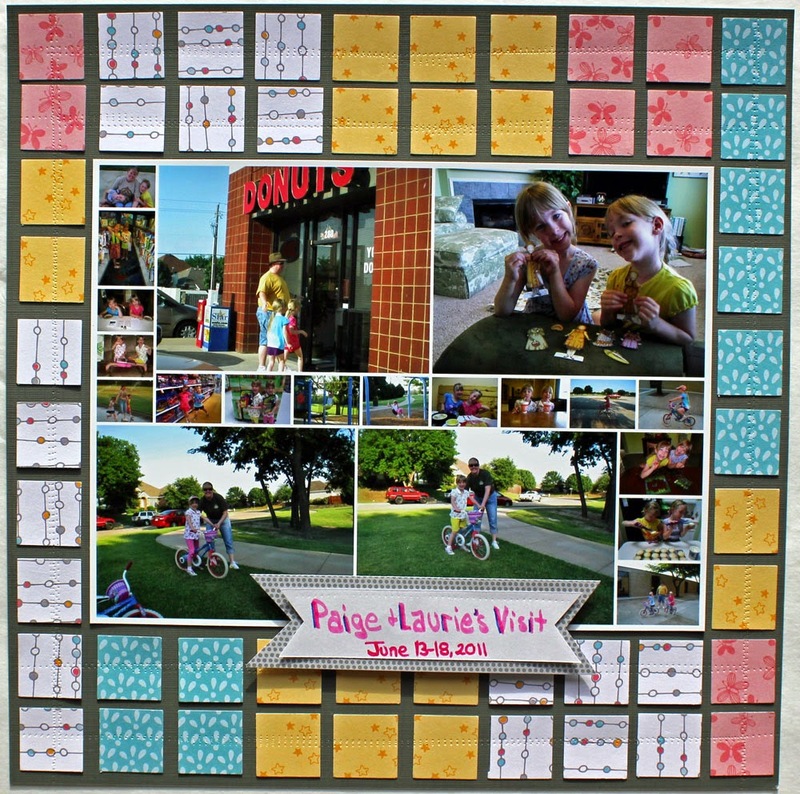 in her challenge to use quilts as INSPIRATION for a layout. Once again, I chose to use a little bit larger design and created a patchwork look around my photo collage. 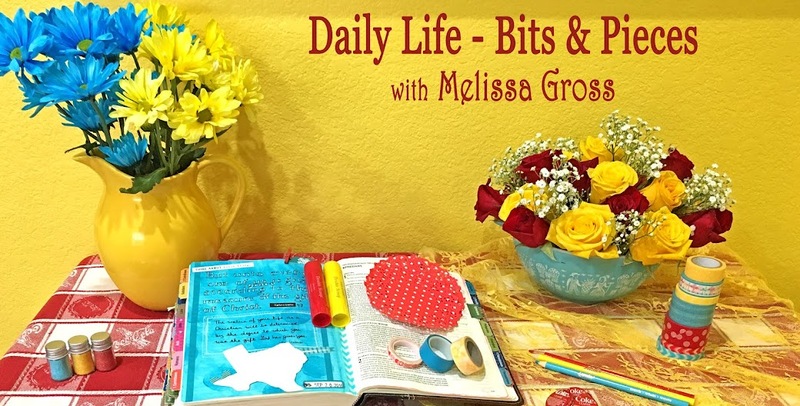 Last week, when I created this layout, I was actually at my friend LeAnne's home for three days of scrapbooking! 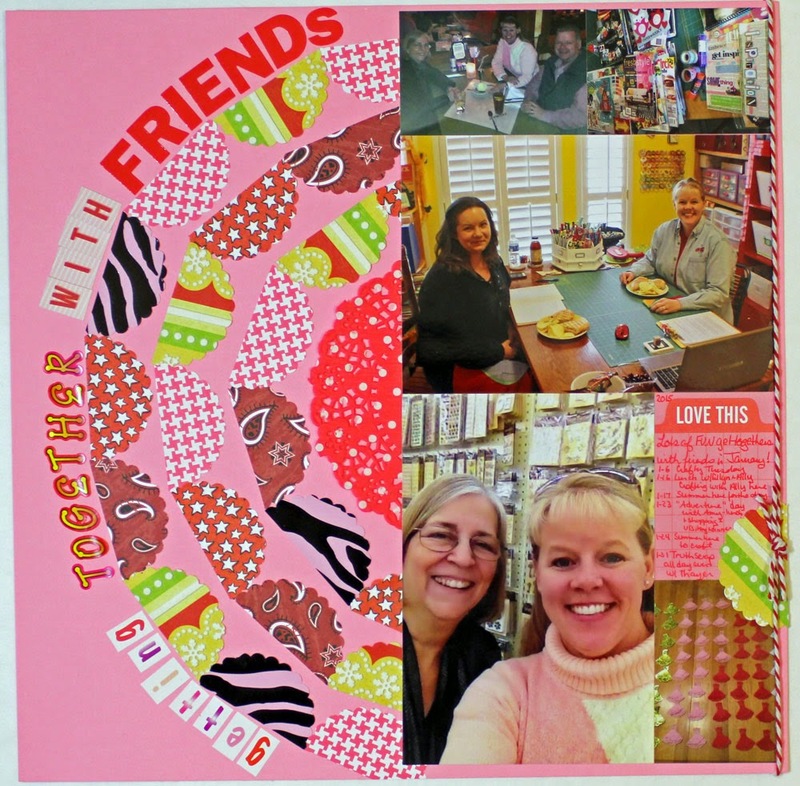 It's so much FUN scrapbooking with friends from online classes. After I adhered everything onto this page, I said, "Do you have one of those roller things Nic Howard uses?" 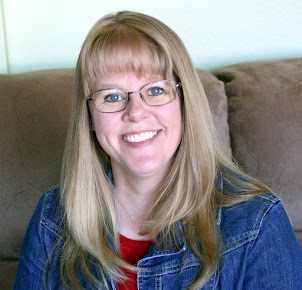 She immediately pulled a pastry tool out of her scrapbooking tool tote, and I had to smile because she knew exactly what I wanted without any other explanation! So I created faux stitching lines around my layout. Thanks LeAnne for inviting me to visit and crop in your lovely home! 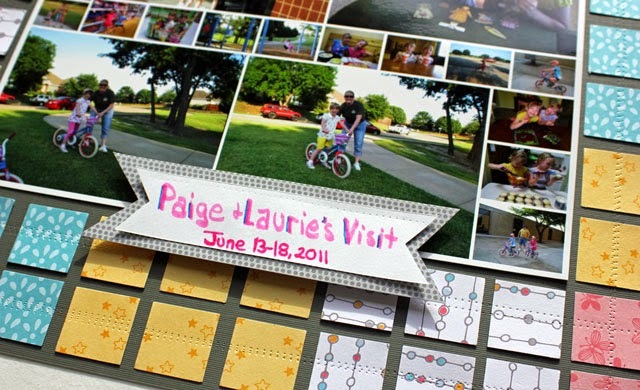 The final challenge in the Paige's Pages class was to create and use a die cut title. I don't use software with my Cricut, so I cut each letter individually. However, I did use Paige's ideas of combining different fonts and patterned papers for the words. I even used my sewing machine to stitch on this layout. 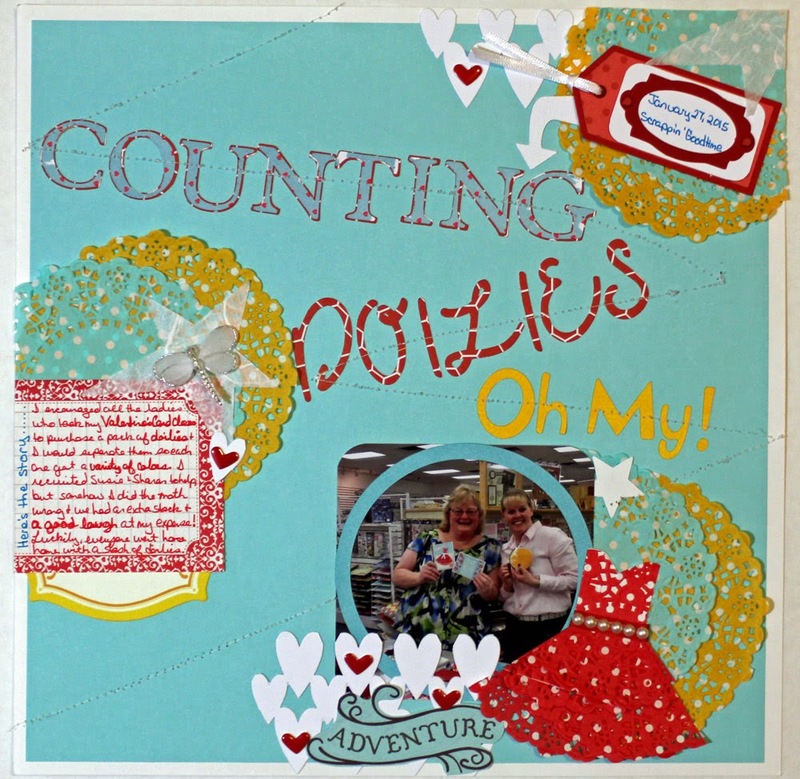 This layout recounts the story of how I somehow miscounted doilies that I was separating (or had help separating) for the ladies in my Valentines Card class, so, of course, I had to use doilies in each embellishment cluster! Will I continue my membership at BPC once my free trial ends? That's the question I'm pondering this week as I'm sharing my creations based on the INSPIRATION I've enjoyed there so far. One of my biggest concerns is whether I'll actually have time to work through classes in the coming months as I have a several other things I'm working on: a scrapbook-for-hire 40+ page retirement album, a Pocket Page Scrapbooking & More class I'll be teaching at Scrappin' Goodtime in early June, my Top Five layouts each month (which reminds me I need to get started on my March layouts! ), and my review of classes from the old BPC site! Decisions, decisions, decisions!?! I love these pages... they look like quilts! Awesome layouts! Such fun and different techniques! I'm always in awe of just how much inspiration you gain from each class. I'm enjoying the class I'm taking at BPC right now, but I don't think I want the commitment of a monthly subscription. I'm really disappointed that they went this route. I'll be interested to hear what you decide. A semi-circle out of semi-circles - now that's clever :). I can understand your hesitation - a monthly financial commitment when you're not sure you will use it doesn't sound like a good investment. Though you've clearly been inspired so far! I'm deciding too. I need to collect some of the ideas to have for this summer when my scrap time will be more limited. That first one is really cute! You've sure gotten more than your money's worth (LOL! ).